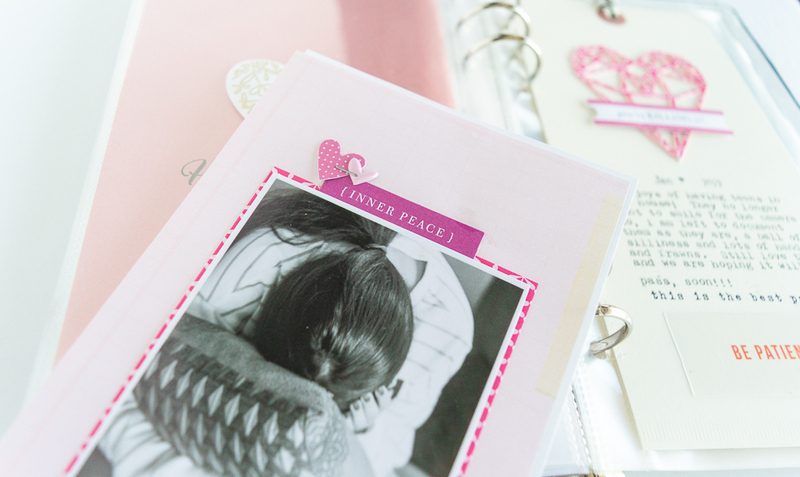 For this page, i decided to play with tones of pink to document a recurring moment in our lives with teens. 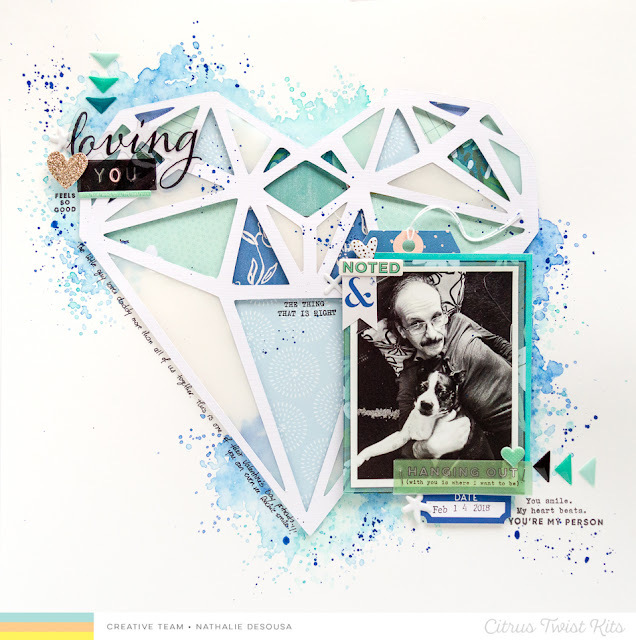 First i picked one of the papers from the kit to serve as the background, and use another one of the papers to mat and layer the picture. This month's Love Stories kit is packed with embellishments, so i pulled a few hearts from the acetate shapes and the puffy sticker sheet to complement the die cut that forms my title. 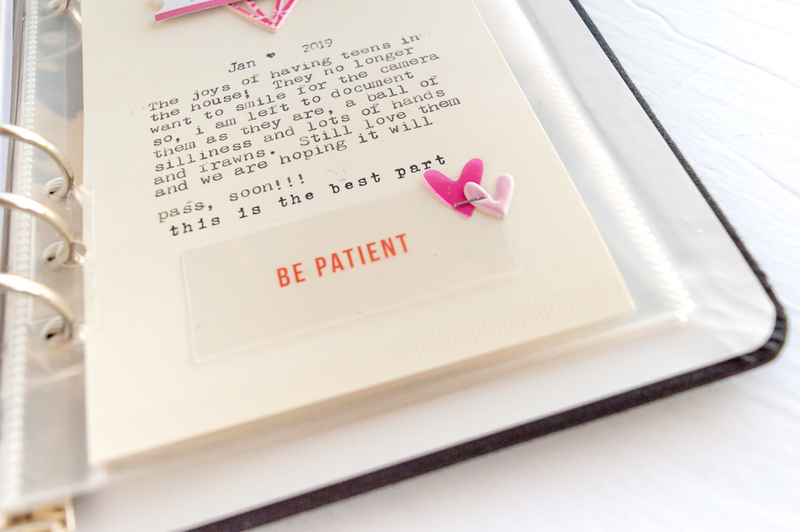 To add the journal of the picture, i used my typewriter on the tag that comes included in the kit. 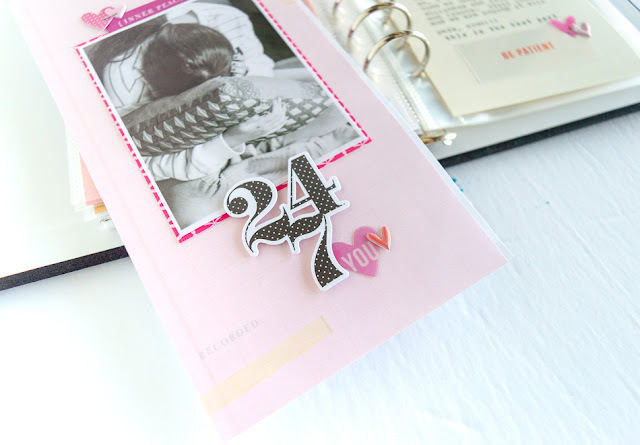 While i typed the story, i set my Cameo to cut the Diamond Heart cut file from the same paper that mats the picture and twice from pink cardstock. 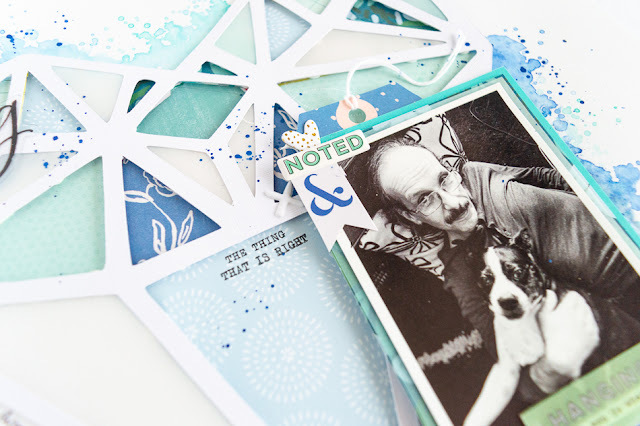 These were glued together to create the dimension on the die cut. 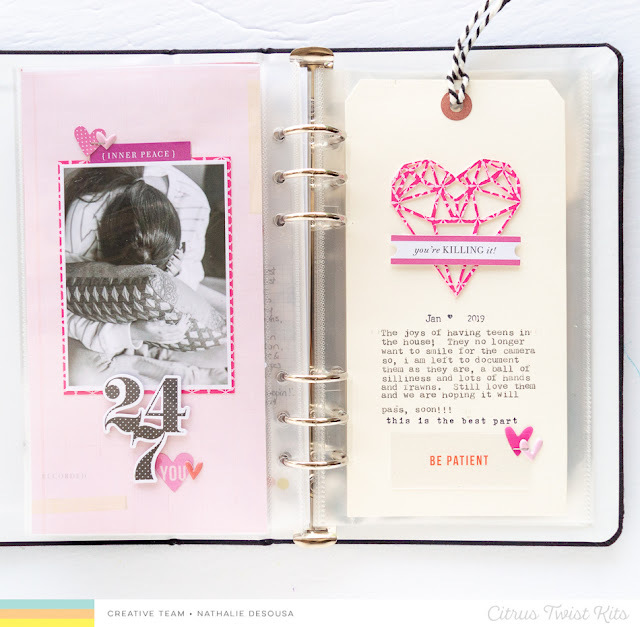 To complete the repetitive prompt of the challenge, i pulled a few more hearts from the Love Stories kit to accent a few of the clusters in around the layout. How easy and fun is that layout, now let me show you a second project using the prompts, the Add-On kit, Love Stories kit, and the Add-on stamp. 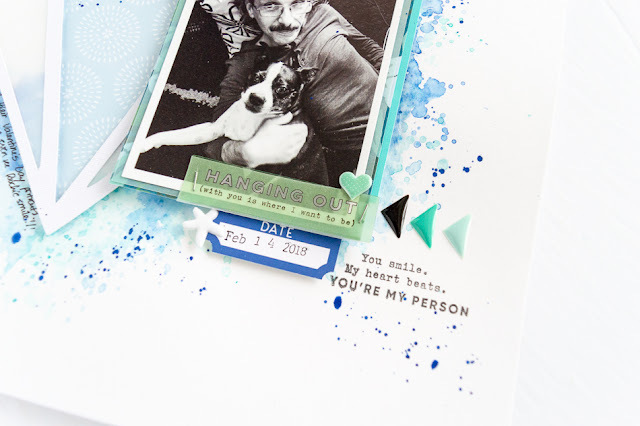 I wanted to create a Valentine's Day page that was masculine and not the usual pink or red, so i chose the cool tones of the papers of the Add-On kit to create this page. Love all the papers and embellishments in the kit! First i added a bit of Pinkfresh Studio watercolor to the background so that they match the colors of the papers. 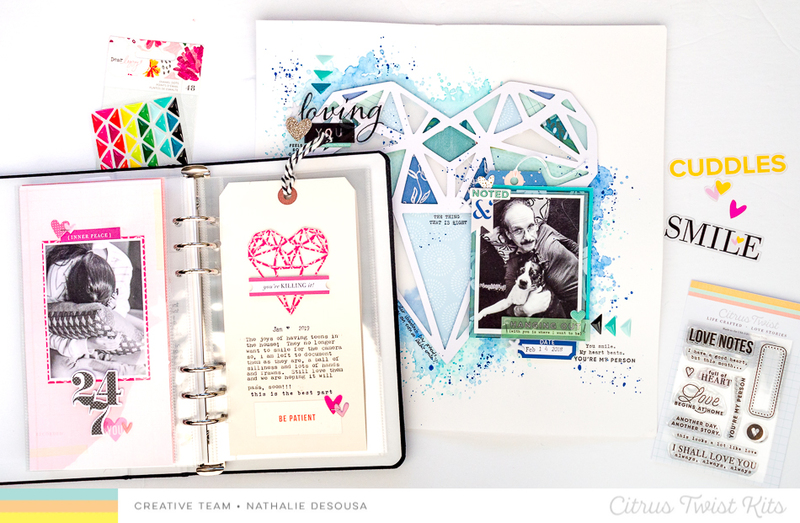 While the background dried, i backed the spaces of the Diamond Heart cut file with papers from the add on kit. 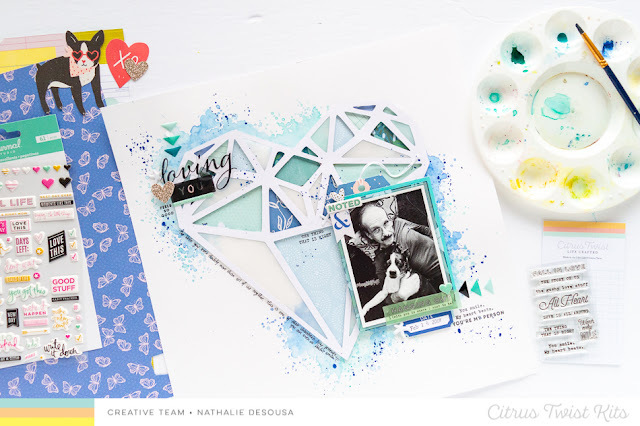 These triangles were the inspiration for my repetitive shape, those small enamel triangles (Dear Lizzy's New Day collection ) came in handy to contimue my repetition of shapes. Since i wanted the background and picture to be highlighted, I chose to convert the picture of my husband and smiling baby dog to black and white. I love how these two projects turned out by following this week 3-to-Inspire prompts and this month's LOVE STORIES, Add-on Kits and Stamps... Now it is your turn to create a project inspired by these prompts. Remember to share your creations with us on our Citrus Twist Kits Friends page on Facebook or on social media by tagging @citrustwistkits or #citrustwistkits. 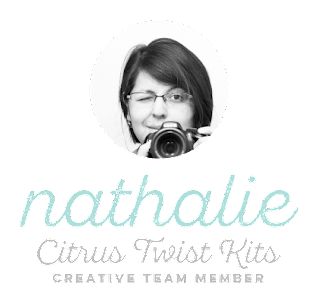 We love to see your works.